The Omni Bretton Arms Inn was built as a private home in 1896 and was first opened to guests in 1907. The inn was a part of the larger Mount Washington and Mount Pleasant Hotels which hosted a variety of visitors and was the distinguished headquarters for the Conference Secretariat during the 44-nation Bretton Woods Monetary Conference in 1944. The Bretton Arms was closed when it became staff housing for the Washington Hotel. In 1986 the inn underwent a restoration and was reopened. It was at this time that it was given its National Historic Landmark designation as part of the larger Mount Washington campus. 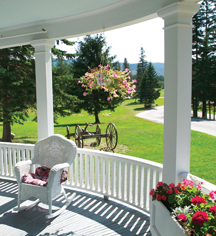 Omni Bretton Arms Inn, Bretton Woods, a member of Historic Hotels Worldwide since 2013, dates back to 1896. With the growing popularity of the automobile in the early 1900s and the Inn's proximity to a 150-car carriage house garage, the Bretton Arms served as a complement to the larger Mount Washington Hotel, a popular destination for the AAA Glidden Tour. Cancellation Policy: 7 days prior to avoid 1 night + tax penalty. Holiday periods vary. Smoking Policy: Non-smoking property. Guests who smoke in the rooms may be charged a fee. The Omni Bretton Arms Inn was built as a private home in 1896 and was first opened to guests in 1907. 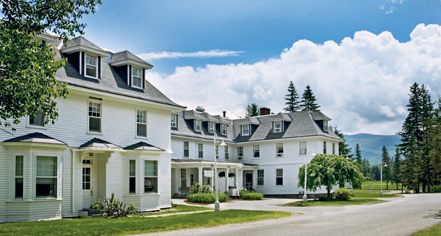 Learn more about the History of Omni Bretton Arms Inn, Bretton Woods .